CashPayz is the place to trade cryptocurrencies. 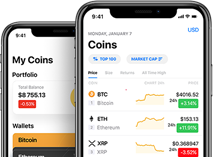 CashPayz’s app for iOS and Android allows users to buy and sell cryptocurrencies and track prices. It’s also a capable wallet for your money, and when it’s time to spend, CashPayz will help you find merchants who accept cryptocurrencies as payment.